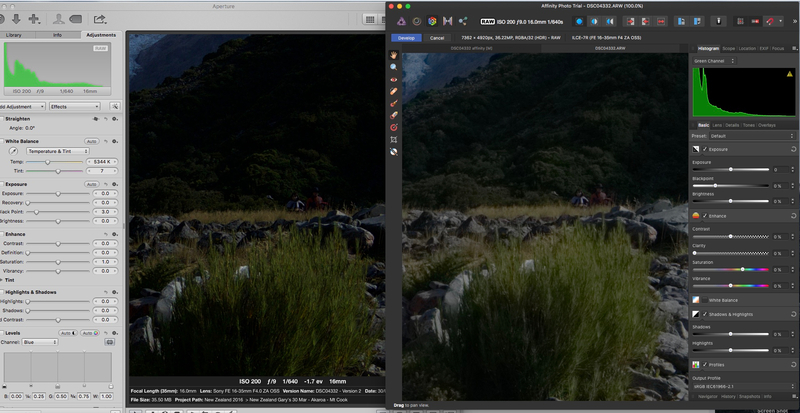 I have opened a Sony RAW file in AP and also opened the same RAW file in CaptureOne. They present compeletly different on the same screen (see attached screen shots). As you can see the detail i.e. green bush mid foreground in the AP software is very very poor compared to capture one software at both 50% and 100% zoom. Also I note that the histogram in the develop persona is completely different to that shown in CaptureOne. The histogram changes when I "develop" the photo and become are more aligned. 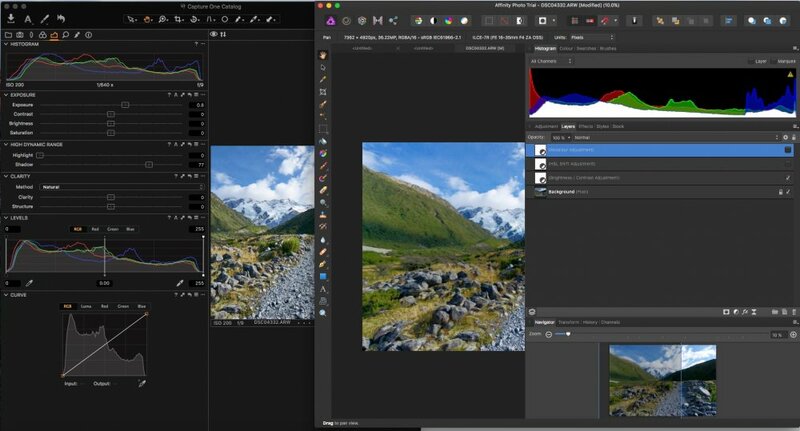 However, the detail in AP is still very very poor compared to CaptureOne, am I doing something wrong in the initial "document set up" stage of the AP process? Your last screenshot is of a close up with no sign of a histogram. Whilst many would acknowledge that RAW processing is something that can be improved in Affinity (and they are working on it), you need to bear in mind that the contents of a RAW file are open to different interpretations. This is why you can easily alter (for example) the white balance in the Develop stage. Different RAW processors will choose different defaults for their initial development. Within the Develop Persona, you can modify the image to appear as you think it ought to look. What you are suggesting is that Capture One's initial 'guess' is closer to what you want. For a different image, or for a different viewer (not you) the choices may be different. 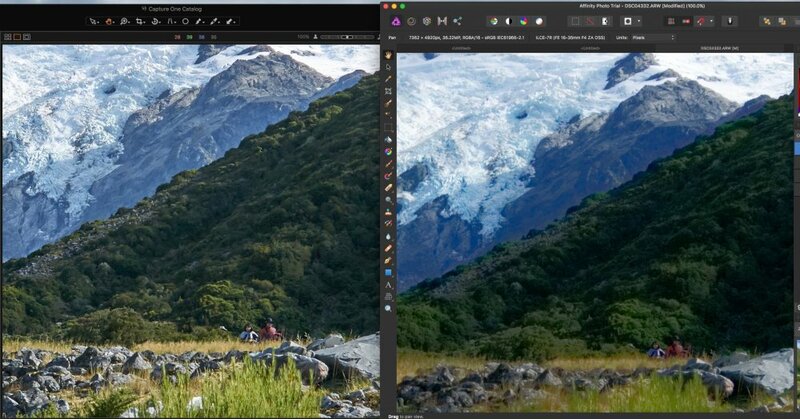 I have to say that I have always found that Affinity's default guess from my Sony RAW files is pretty close to what I want. Upon initially setting up AP Document Set Up do I need to do anything when opening RAW files or just open them? Sorry, I had a bit of trouble loading the screenshots in the correct order I stated, the comparison of the histograms is shown in the first screenshot. 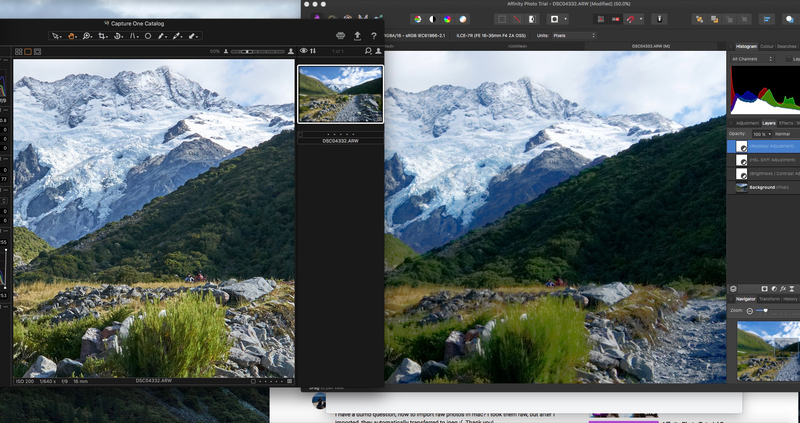 I've included a screenshot comparison of the RAW file with Aperture this time. Untouched in both aperture and AP. AP interpretation of the green bush again appears to lack the definition compared to Aperture too, (Sorry, I know there a bit dark but I've not adjusted them). in AP no amount of adjustment of the RAW file brings back the definition and correct structure of the bush compared in either Aperture or Capture One. I will try AP with some other RAW files before giving up on this trail of AP, but its got off to a bad start compared to other RAW convertors. Perhaps I should use those initially and then import JPEG or TIFFs in to AP? Have you tried the Clarity slder in AP? This could well improve the definition and structure of the bush. If you can find a suitable combination of develop settings, then you can save these as a preset and as the default for your RAW files. Pour améliorer la productivité, certains logiciels, tel que DxO créent un " autoréglage " prédéfini. On peut l'annuler pour RAW tout à fait neutre. Affinité semble proposant (sauf erreur) des RAW neutres, avec libre cours aux goûts personnels. John Rostron à raison, la commande Clarté est très efficace. Elle donne des résultats intéressants de type "microcontraste". Thanks John and Wikinger for your support. Wikinger's comment, translated below via google translate. I have tried the Clarity command, it does improve things but is still poor in comparison with the other RAW convertors I have, CaptureOne, Aperture and Apple's Photos(Stupid name IMHO). Below is a screen shot of my result with adjusting the Clarity setting and others in the Develop persona. I realise this is just the starting point (Develop stage) and I can work on it further in Photo Persona, but honestly it such a bad starting point I can't be bothered to try further manipulation in photo persona. To me the whole art of photography is making the camera/process invisible to the viewer. I cannot perceive this with AP so far. I think I will move on to using RAW converted TIFFS by other programmes such as Aperture in AP during this trail period. I might also look at RAW conversion DXO have to get a trial version though, so thanks again. To improve productivity, some software, such as DxO, creates a predefined "autotune". It can be canceled for RAW completely neutral. Affinity seems to propose (except error) neutral RAWs, with free course to the personal tastes. John Rostron rightly, the Clarity command is very effective. It gives interesting results of the "microcontrast" type. Capture One is specifically set for ICC Profile of "Sony A7R" with curve set to "Auto" this clearly makes all the difference to interpreting the RAW data. I hadn't realised how significant this is until comparing it with generic convertors. Well I am a newbie to this game. Unfortunately this does not help with my affinity towards AP, no pun intend there. Le profil automatique de Capture On peut être détourné. Ce préréglage est à réserver au travail de masse, grand public. (Ne voyez aucune condescendance dans mon propos). A regarder ces deux dernières images, on voit nettement que celle de gauche est optimisée. L'image de droite, semblable à celle d'un RAW neutre. Si vous essayez DxO, vous serez peut être déçu. L'image ne correspond pas à votre ressenti car elle est très neutre. Le RAW de DxO vous semble sombre et fade. La très grande quantité d'information contenue en est la cause. J'utilise DxO depuis sa version 5 et je supprime toujours l'autoréglage proposé pour une image neutre. Il faut également retenir les paramètres sur le boîtier, lors de la prise de vue. Excellente fin de nuit à vous. Thank you for your reply, translated via google below in italics. I have since tried the following RAW conversion and saved them as 16bit Tiffs then opened them in AP. All of them give superior conversions to AP in my humble opinion. RAW conversion carried out with the following programs to 16bit TIFFS then reviewed in AP. Capture On's automatic profile can be hijacked. This preset is reserved for mass work, general public. (Do not see any condescension in my remarks). Looking at these last two images, we can clearly see that the one on the left is optimized. The image on the right, similar to that of a neutral RAW. If you try DxO, you may be disappointed. The image does not match your feelings because it is very neutral. The RAW of DxO seems dark and bland. The very large amount of information contained in it is the cause. 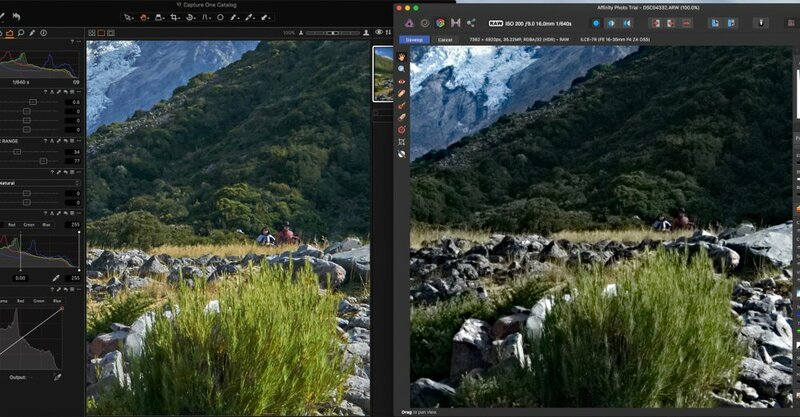 I'm using DxO since version 5 and I always delete the auto-tuning proposed for a neutral image. It is also necessary to remember the settings on the housing, when shooting. Excellent late night to you. You can get a version of Capture One for Sony for free. Visit their website and search fot Special Edition for Sony. The deal is that Sony gets a RAW processor to give away with its cameras. As you might expect, it does not have the full bells and whistles, but it might suit you.